Norway cruise experts Hurtigruten have introduce a brand new whale watching experience to their popular Classic Voyage North itinerary. 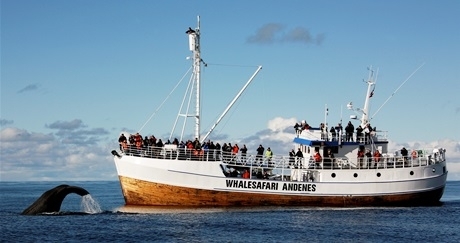 Guests leave the ship on day 5 in Risoyhamn and travel to the port of Andenes where they embark the whale watching ship. The ship sails to the edge of the continental shelf which is where the majestic sperm whales gather to feed. This location is one of the few in the world where the continental shelf is so close to the mainland. The ship's crew can track the whales by using hydrophones, and in 90% of sailings they manage to locate the whales. The excursion ends after 7 hours and the guests are returned to Finnsnes to re-join their Hurtigruten ship. The Classic Voyage North sails from Bergen to Kirkeness between 1 June and 31 July. Fares start from £1,143 pp, cruise only. The Whale Watching excursion costs £205 pp.